Angela’s fellow Triple M union members sporting the #TeamAngie T-shirts in Lethbridge. On May 15, 2017, Angela Entz’s life changed forever. While working on the wall systems at Triple M Housing in Lethbridge, the roofing jig system failed and the steel frame collapsed onto Angela… crushing her vertebrae and paralyzing her. A floor framer for over nine years, Angela had always been a very healthy and active 37-year-old woman who loved yoga, kickboxing, lifting weights, mountain biking and hiking. Now, it’s very unlikely she’ll ever walk again or return to work. Her home is no longer a place of comfort, but just another inaccessible space. 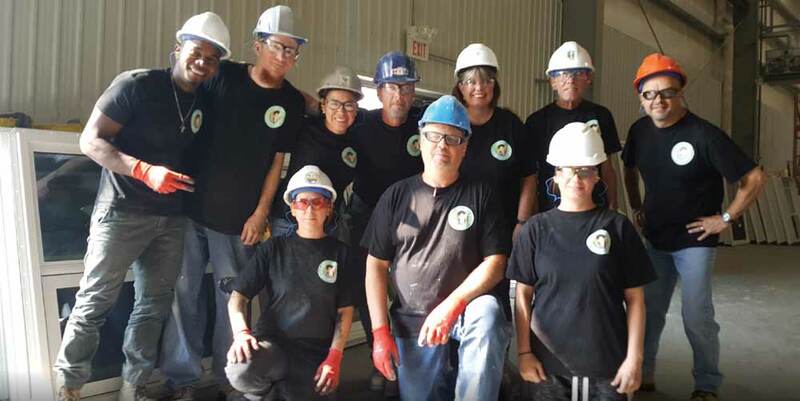 To raise enough money for a down payment on a new home for Angela, her sisters and brothers at Local 2010 in Lethbridge have started a T-shirt campaign. Once the down payment is secured, the Alberta Workers’ Compensation Board will fund renovations that will give her wheelchair access to every area of her new home so she can live her life to the fullest. T-shirts are on sale for your donation at the Edmonton, Calgary and Fort McMurray union offices and of course in Angela’s hometown of Lethbridge. Join #TeamAngie! It’s time to show our solidarity and support this strong courageous sister who will be learning how to live her life again. ACTIMS Women in Trades Awards & Bursary 2019 – Apply now!